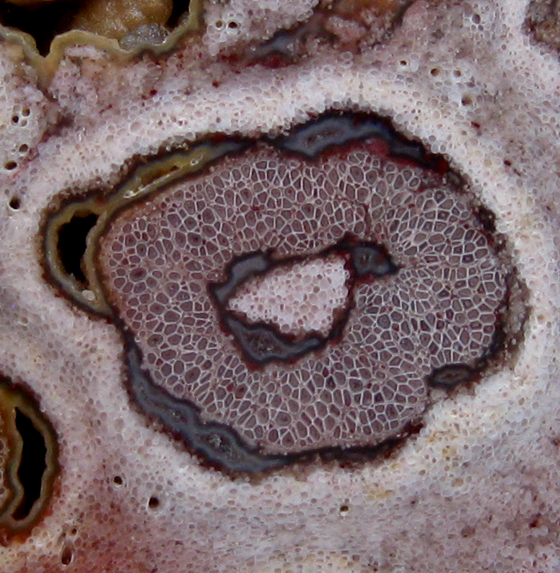 A cross-section of an aerial root found in the mantle of a tree fern reveals the central, star-shaped xylem. 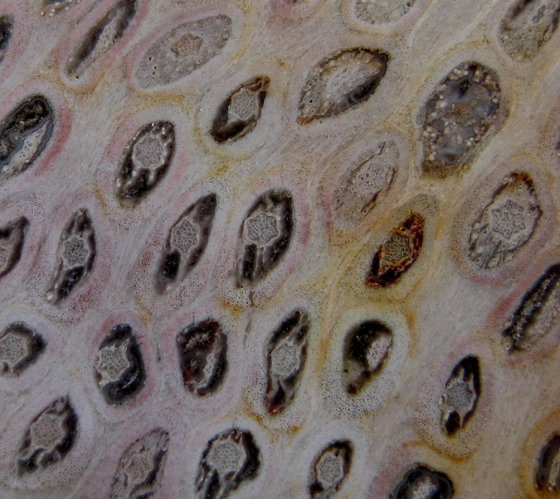 As the aerial root developed, primary xylem grew from five to nine different points. Metaxylem was then produced towards the center forming a star shape. Phloem tissue developed between the arms of the star. Cortical tissue and air spaces surround the xylem and phloem tissues. 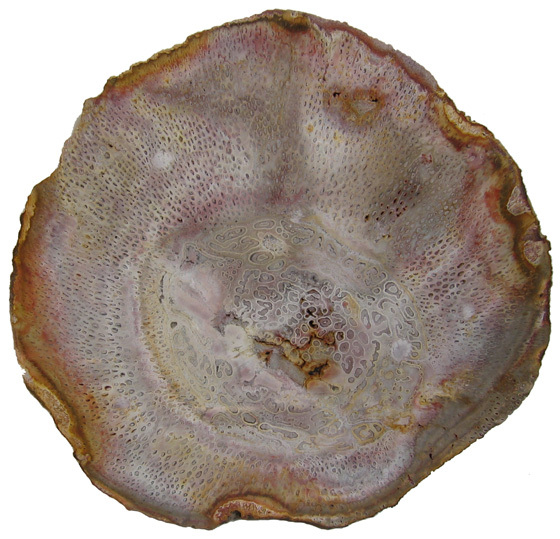 A sheath made of sclerenchyma cells enclosed the cortex. 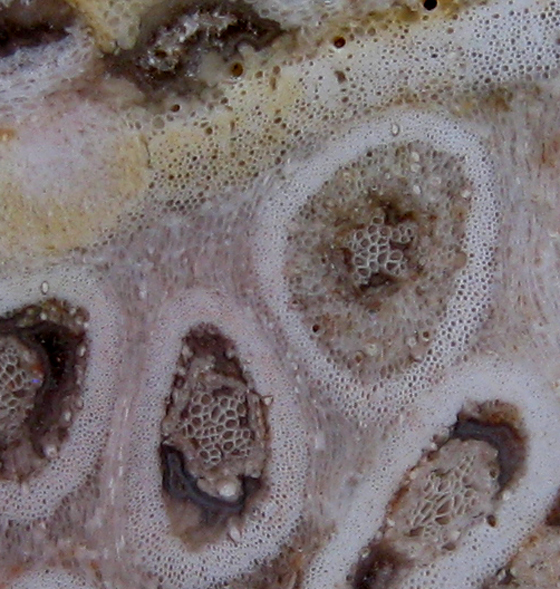 The root epidermis and cortical cells outside the rootlet proliferated to produce a dense mass of parenchyma tissue that held the root zone together. The aerial rootlet pictured above comes from a permian-aged Brazilian tree fern (Titea singularis). The picture was taken at 30x. 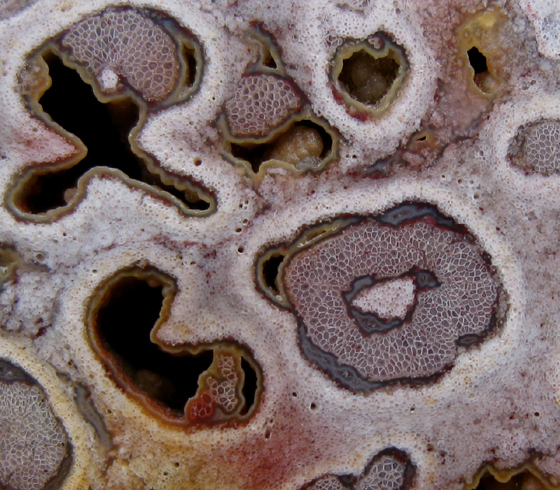 Below one can see the specimen from which the micrograph was taken. To view a series of images that zoom in on the individual rootlet visit the Brazil Gallery (slide 1) in the Permian section of our website. Close-up photographs of Titea singularis reveal plant tissues preserved in silica exhibiting beautiful pastel colors. The star-shaped xylem of the individual rootlets may conjure up images of snowflakes. In the image above one can see adventitious roots from the inner part of the mantle. Proliferating epidermis and cortical tissues appear to "flow" around the individual roots which they interconnect. The images below zoom in on vascular tissue found in the central vascular cylinder of the specimen above. 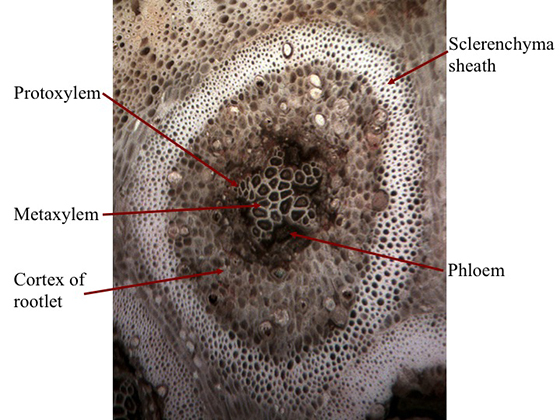 Phloem can be found on either side of the xylem tissue.